I had a fabulous day today at the Utah Association for Gifted Children conference. I got a ton of new ideas that I'm super excited to share. Our presenter, Ed Zaccaro, had a fabulous breakout session on math called Nurturing a Mathematical Gift Into a Passion. He had a great idea - an Einstein Award. It's an award for teachers to have on hand for when a student answers a question that no one else can answer, or for having a math 'aha moment' for the first time, etc. I love this idea! How often do your "gifted" math students get recognition?? Our presenter said that athletes get awards, praise, and recognition all the time for sports. Our students need that same kind of recognition for math! 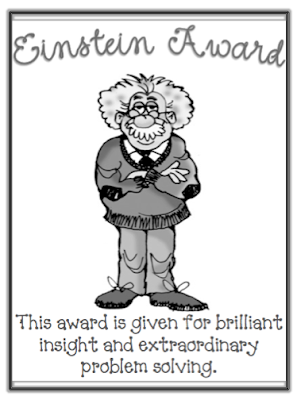 Here's my version of the Einstein Award for you! I can't wait to implement this idea into my class first thing Monday morning. What do you do to recognize your high math students? I'd love to gather more ideas!